The default driver-package for meteor test-packages is ‘test-in-browser’, which will run meteor test-packages with hot code pushes and an HTML reporter, where you can view your tinytest or munit test results. test-in-console is a driver-package that meteor uses to test their own core packages internally from the command line and in continuous integration environments. It runs the tests for each connected browser only once, without hot code pushes, and prints the results to the browser console, instead of displaying them in an html reporter. spacejam runs meteor test-packages using test-in-console, waits for meteor to be ready, and then starts phantomjs, a fully featured headless (no UI) browser, to run package tests both server side and client side, in phantomjs. Once all the tests have completed, spacejam exits with 0 if all the tests have passed, or with a non-zero exit code, otherwise. For a full list of possible exit codes, visit the spacejam documentation. If you don’t specify any packages, it will test all packages in the ‘packages’ folder, as well as all packages found in folders listed in the PACKAGE_DIRS environment variable. Will start meteor test-packages with –port 4096. Will not respect the ROOT_URL environment variable and will set it to http://localhost:4096/ before starting meteor test-packages. Will not respect the MONGO_URL environment variable and will unset it before starting meteor test-packages. This design decision was made since we use free mongohq (compose.io) sandbox databases as our app’s mongodb during development, which is closer to our production scenario, and we didn’t want any data manipulations in our package tests to affect our meteor app, so we run our package tests on meteor’s internal mongodb, which also has the benefit of being faster. If you still want to specify your own port, ROOT_URL or MONGO_URL for your package tests, you can do so using the –port, –root-url, and –mongo-url command line options. For a full list of command line options spacejam supports, visit the spacejam documentation. Start a new clean ubuntu virtual machine. Run the instructions in your .travis.yml file, and save all output as builds logs for your review (you can also view your build logs in real-time). So, let’s get our hands dirty. # All installation prerequisites before running your build / tests go here. # All build / test commands / scripts go here. # For testing meteor packages, that's all that is needed. Add and commit the file, push it to GitHub, and your first Travis CI build will start automatically. Yeah! To view the build results of your latest build, just click on the Current tab in Travis CI. If your GitHub repository is a meteor app repository, or you have more than one package you want to test in the same repository, just use the same spacejam command(s) you would use to test those packages from the command line in the script section of your .travis.yml file. For those of you who are not familiar with practicalmeteor:munit yet, it is an extension of tinytest with support for BDD style describe.it test suite semantics. It uses the same reporter tinytest uses and it can be used along side tinytest in the same package, allowing you to gradually migrate your tests from tinytest to munit. Travis CI allows you to easily configure the sending of build result notifications to many destinations, including Email, IRC, HipChat, WebHooks, etc. To view the list of supported notifications and how to configure them in your .travis.yml, visit the documentation. 90%? 🙂 nevertheless, I’ve added it to the top, but Travis CI in itself should be a reason to use it, so package users can have confidence that package authors are testing their packages and keeping them in good shape, including for the 10% ubuntu users 🙂 On the same note, I’m looking for access to an os x clould vm to finalize the support for spacejam on os x, any recommendations on a service I should use? Can spacejam output test results in, say, JUnit XML? That would be handy when running on Jenkins/Bamboo/etc. UPDATE: just found https://github.com/practicalmeteor/spacejam/issues/19 . Cool! It looks like you need to add “sudo: required” to the top of the .travis.yml file now to get this working. Tried to reproduce it on this repo, and couldn’t:nnhttps://travis-ci.org/practicalmeteor/meteor-loglevelnnnnCan you point me to a repo that I can fork where this is needed? Reproduced it myself too. Have no idea why it happens in your package, but not in any of mine. Read your code too, and didn’t give me any clue. i’ll add it to the spacejam README. FYI, you should update your .travis.yml to node 0.10.36, since this is the node version meteor 1.1.0.2 has been “certified” against. Very weird…anyway, thanks for the tip! Calvin, I think I came across your problem. You were running on Travis’s new docker based infrastructure, that doesn’t have sudo support, so meteor’s installation couldn’t link itself to /usr/local/bin and meteor could not be found on the PATH. By adding sudo: required, you were moved back by Travis to their old infrastructure, so sudo could work in meteor’s installation. 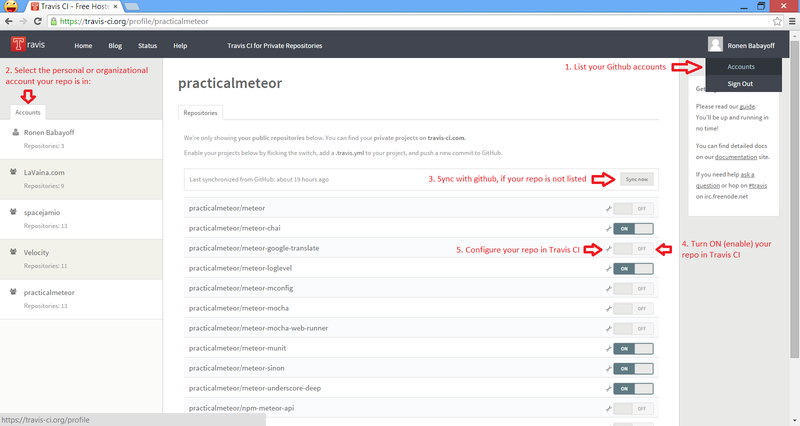 But, there is way for you to use Travis’ new and faster docker based infrastructure without sudo, I have posted about it just a couple of days ago: http://practicalmeteor.com/testing-your-meteor-packages-on-travis-cis-faster-docker-based-infrastructure/. Check it out and let me know if it works.